By day, Rob Dineen, 42, is a hospital doctor working at the Queen's Medical Centre in Nottingham. Despite the demands of his job, though, he still finds time to coach at Erewash Valley Gymnastics Club in Long Eaton. Erewash Valley Gymnastics Club coaches boys and girls of a variety of ages. "I started coaching about five years ago when my two sons started gymnastics. Since then I have completed level 1 and level 2 coaching qualifications with British Gymnastics." "I mainly I coach the Men's Artistic discipline at Erewash Valley (the type you see the male gymnasts doing at the Olympics). "I now coach the 13 to 18 year old competitive squad on Wednesday evenings and Saturday mornings, and at East Midlands Regional training sessions with gymnasts from my group. "I did a lot of gymnastic myself when I was young and competed a national level, but stopped in my late teens. "I had nothing to do with the sport for nearly 20 years, until my sons started gymnastics. "While coaching I wondered whether I could still do any gymnastics, and so started going to an adult class at the club. After training regularly for a couple of years myself, I entered the British Veterans Championship, becoming the 2015 British Champion in the 40-50 year-old category. "I've learned such a lot since starting to coach! I knew many of the moves from my days as a gymnast, but understanding how to coach them has been a steep learning curve. 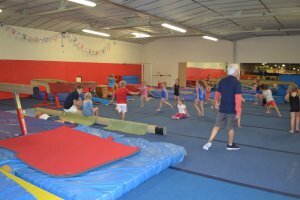 "I've also had to develop my planning and organisation skills, to keep the training sessions running smoothly and to keep challenging the gymnasts. "A lot of people have taught and helped me over the past few years, but Sue Snelgrove has been a constant source of guidance and inspiration during that time. "The thing I really enjoy about coaching is seeing the boys master moves that they have struggled with, and grow in confidence with the difficult moves. "I think a good coach possesses a mixture of things. Obviously there's technical knowledge and safe supporting skills, but with the teenage lads I coach I think it is really important to have a good rapport. "Without the coaches and volunteers, an awful lot of sport and physical activity just wouldn't happen – it would be a disaster for the young people in the area. "What keeps me motivated to keep coaching is simple – I enjoy it! "Now we have some great new coaches at the club and in the region and I hope to learn from them and develop as a better coach myself." "My advice for others thinking about going into coaching or volunteering is simple… go for it! "It might seem scary or intimidating at first, but there will be people around who can support you. And don't be afraid to ask for advice or help if you need it."